"I must say I feel part of the PHOWN project. This holiday in KZN was a very rewarding experience. 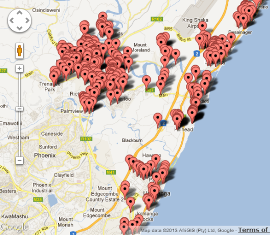 Although it was a bit frustrating to spend at least three hours editing photos and downloading data for every hour spent nest hunting, I managed to plot most of the Village Weavers in the Umhlanga, Umdloti, Verulam, La Lucia and Tongaat area. I focussed on these areas because of the fact that there were very little closed or gated communities where it is normally very difficult to get access and it was easy to access most of the streets in these towns. It was interesting to see that most of the Village Weaver nests occur in gardens where there were not many indigenous trees and the nesting trees were open, for example palm trees, and also in thorn trees, especially fever trees. In the more 'affluent' areas with lots of big indigenous trees there were very few Village Weaver nests except when there was the odd fever tree. In the townships with mostly fruit trees in the garden, there were also few Village Weaver nests. Quite a middle class bird. In the process I also managed to see a number of Thick-billed Weaver, Southern Red Bishop, African Golden Weaver (Yellow Weaver) and Spectacled Weaver. 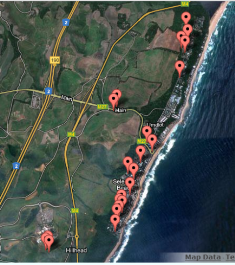 I managed to plot most of the Spectacled Weavers in Umdloti. This was a bit of a challenge as they are a bit more secretive and it is not always possible to access the properties where they nest." Map left shows the Spectacled Weaver nests around Umdloti. One record was of a Spectacled Weaver nest where the tube was extended some time after the nest was built, as shown by the difference in colour of the nest materials (photo right, from phown 4378.